"There’s no way of us knowing how he got ahold of the drugs ... It could have been a pot cookie or muffin that someone threw out." 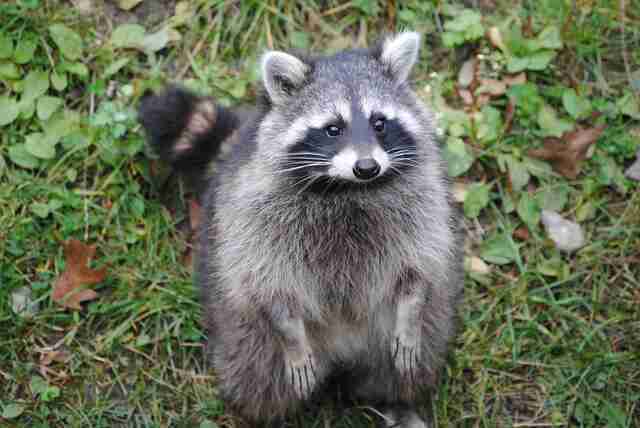 As much as raccoons may like trash, they really should not get trashed. Hopefully the animal at the center of this story has now gotten the message. One morning last week, a concerned citizen in the town of Gibsons, British Columbia, spotted something in her yard that she couldn’t ignore. There, lying curled up and seemingly paralyzed, was a raccoon in distress. Fearing that the animal had been injured, she called the Gibsons Wildlife Rehabilitation Centre — a rescue facility run by Irene Davy and her husband, Clint. Soon, help was on the way. 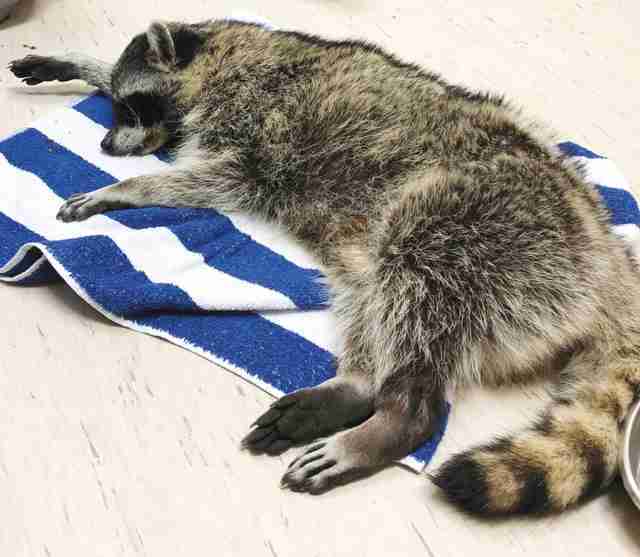 Believing the raccoon may have suffered a serious spinal injury, Clint transported him to the Sechelt Animal Hospital. But after an examination, vets came to a surprising conclusion: The raccoon wasn’t injured. He was stoned. Sure enough, tests had come back positive for marijuana and benzodiazepines — a class of drugs that includes anxiety medications like Xanax. "He was fine. He was just rather high on drugs," Irene said. "There’s no way of us knowing how he got ahold of the drugs, but I’ve heard of dogs picking things up while on walks. It could have been a pot cookie or muffin that someone threw out. Who knows?" This is the first time the rescue center has had to deal with a drug-intoxicated wild animal before, but fortunately, the treatment was rather simple. "All that we could do for the raccoon was bring him back to the center and put him a dark, quiet place. He recovered in about eight hours," Irene said. "He was fine. He might have been a little hungover, but he was 100 percent better compared to when he first came in." That evening, the raccoon was ready for release back into the wild. Given the increasing popularity of edible forms of marijuana, cases of accidental ingestion by pets at home have been on the rise. But exposure to improperly discarded drugs by wildlife is a danger not often considered — though the consequences could be deadly. 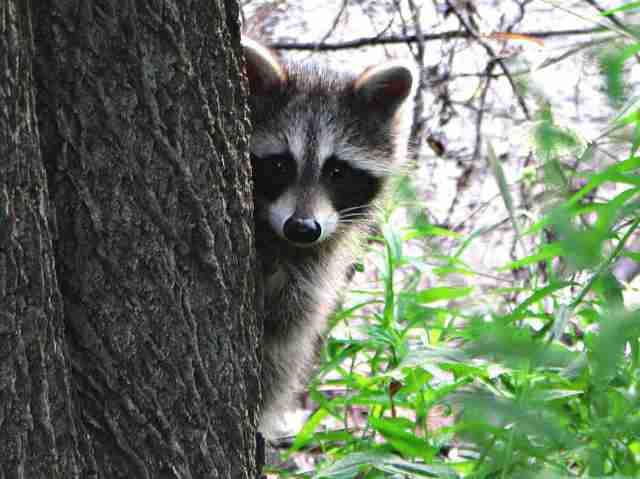 "For that raccoon, it’s lucky he ended up in someone’s backyard. Had he wandered onto the highway, he could have been hit by a vehicle. He could have been attacked by a predator. He could have been open to any kind of injury, since he was not able to move," Irene said. "People who care about wildlife, who happen to use drugs, should be careful about how they dispose of them. I know it’s kind of funny to say that you’ve had a raccoon high on marijuana, but in the scheme of things, it’s not funny to think that wildlife could be harmed."